Chicago French Market is proud to be among the first Chicago-area businesses to support the outstanding work of The Good Food Project, a not-for-profit organization that brings fun and interactive food tastings to schools to teach kids to become young food critics and help them develop a lifelong love of good food. 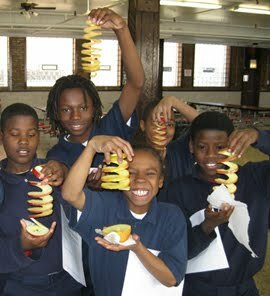 Chicago French Market’s support has already provided apple tastings to children at Cleveland Elementary School, Saint Ann Catholic School, CICS Longwood and CICS Washington Park with more to come. Chicago French Market vendors City Fresh Market, Produce Express and Chicago Organics provide produce for the event. For information about The Good Food Project or to arrange an apple tasting in your child’s school, visit http://www.thegoodfoodproject.org/ and contact Susan Taylor at file:///C:/Documents%20and%20Settings/goodfoodchicago@gmail.com or 773-648-0068. The Chicago French Market is a proud sponsor of The Good Food Project. For more information, visit http://www.chicagofrenchmarket.com/.